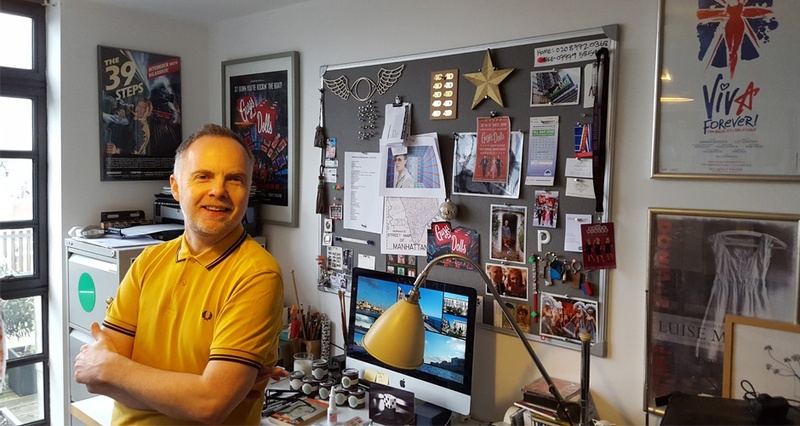 With countless West End credits to his name, Peter McKintosh is the design mastermind behind some of the country's most successful stage productions. 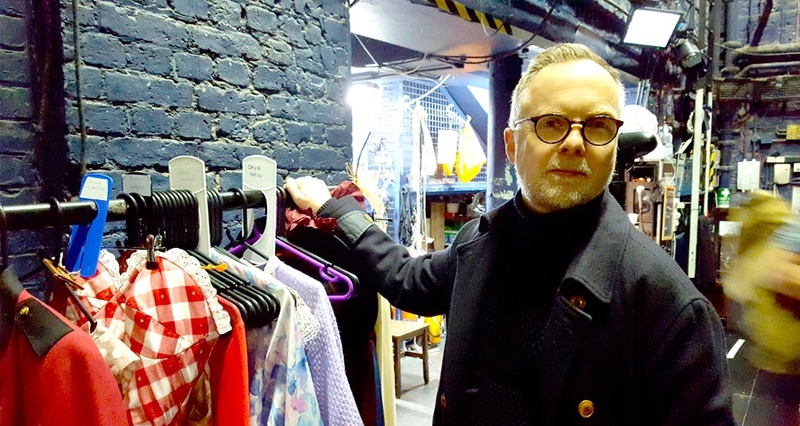 In a career that has landed him an Olivier award (Best Costume Design for Crazy for You) and Tony Award nominations (The 39 Steps), Peter has created sets and costumes for everything from plays to operas, and so understandably we couldn't resist the opportunity to meet the man himself. 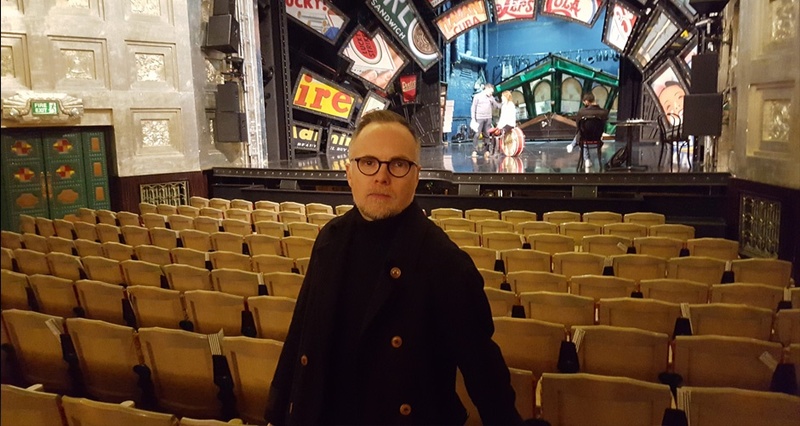 We caught up with Peter to talk about his latest design venture for the hit musical Guys and Dolls, currently playing at the Savoy Theatre. So Peter, on Guys and Dolls, you once again have the challenge of designing both the set and the costumes. How do you approach them differently? I always start with the set because I think that gives you the world. I struggle a bit to know what the costumes are going to look like until I've created the environment that they exist in - I've only once done just costumes and only once done just set and I find both of those things slightly less satisfying than making a whole world; especially with a show like Guys and Dolls, which is - when you look at it - a particularly complete milieu. What did you want to express in your designs for Guys and Dolls? The language of the play is slightly heightened - the Damon Runyon book has a certain rhythm that is not a very natural way of speaking. I wanted this stylisation to somehow be present in the design. We wanted to create a world that mirrored this heightened reality... the way that people move, the way people speak, the way people look. The really clear silhouettes the shapes and colours. So when you look at it, I hope it is a world that is incredibly inviting; it makes you want to enjoy it. The show, more than anything, is the ultimate feel good musical. Also, coming out of the war, New York, in the late 1940s, was a time of prosperity. So we wanted to celebrate that kind of post-war optimism; for it to feel big and happy and colourful, because New York was colourful then... very colourful, in fact! The company performing in 'Guys and Dolls' at the Savoy. When the show was at Chichester, it was staged in thrust. How have you adapted it for the Savoy? Well, Id actually designed the show before, some 15 years ago! I didn't do it like this, but it was, interestingly, also on a thrust stage, so some of the solutions seemed logical to carry through. Gordon (Greenberg) and I, talked about how we conjured up New York, suggestively rather than literally. At Chichester they dont have the facility to fly scenery, which means we cant fall back on the usual ways to change scenes we had to think differently about how we made our world. So it was interesting to do it for Chichester, to find one solution to it, for a thrust stage, and then take it into a theatre like the Savoy, that does have flying and embrace that a little bit. Yes! We assembled a ton of vintage advertising images to dress the set with, amongst them the Roxy, the Havana rum, and the Pontiac signs... I think that finding the ones that became specific to scenes in the play was all just happy discovery, as we designed it. And also the use of lighting; how Tim Mitchell has chosen to light each of the signs to guide the audience through the story. but it ended up being a distraction. We had it and it just wasn't as good as simply lighting up the American Airlines sign to say "now we're going to Havana!" 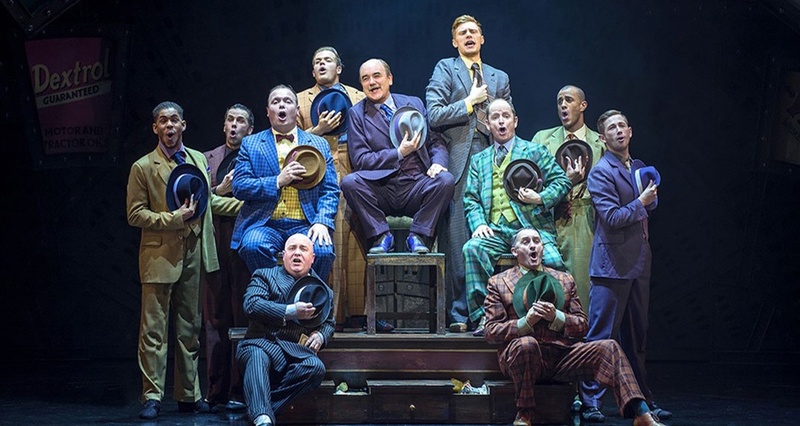 David Haig and the company performing in 'Guys and Dolls' at the Savoy. How do you use colour, particularly in the costumes, to capture that New York energy? Often, when I design a set of colour coordinated costumes, I like to get a broad palette on stage, but one where each tone works with the other. This often makes the sourcing of fabrics a challenge. We worked really, really hard to find suit fabrics that have all got something going on in them. Most of them have got a check of some description; there are very few stripes. Theres always one colour thats hard to find, but the challenge is to hold ones nerve, and really stick to your guns, in the hope that that elusive cloth will turn up somewhere. We had to find 10 mens suit fabrics that all looked fun and tonally sympathetic. It took us a while, and we scoured the country (it was the green we struggled with! ), but we did finally find something for every design. You've done a lot of musicals as well as operas and plays before. Do you have a different way of working for each type of show? You can only really approach each thing individually and respond to it by reading the script, listening to it, and talking to the director. For example, my version of My Night with Reg was absolutely simpatico with my director's vision. But I've also done Shakespeare plays where I have one idea and the director says "no, no, no, it should absolutely feel like this!" And that might just be a texture - I might see it in metal and they might see it in wood! So it's about gut responses, shared responses, and often, also, complex puzzle solving. So when you are in charge of costuming a show, where do you begin? When we talk about shapes of the late 1940's, what strikes you? With mens suits of the 40s, the shoulders were slightly bigger, the trousers wider. They got narrower into the late 50s. Everything got a bit trimmer. American suits of that period were generally much boxier than English suits, too. They were on their way to exaggeration... the 1940's, then the 1950's got a bit more exaggerated and the 60's reigned it right back in! With the women, it's also about an exaggerated profile. The shapes of those big 50's skirts, and the petticoats pushing them out. You get a lovely silhouette, of bounce and fun. Sophie Thompson and the company performing in 'Guys and Dolls' at the Savoy. 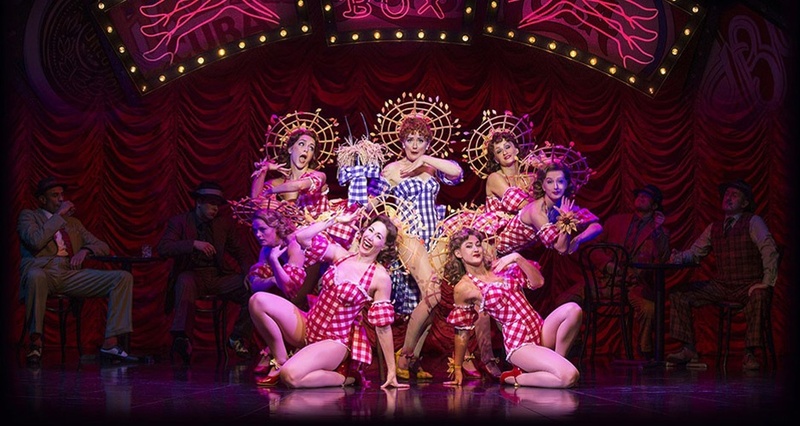 Finally, everybody talks about the enduring appeal of Guys and Dolls - why do you think it still attracts audiences today? It's the perfect musical. It really is. Most experts would say it is one of the best musicals ever written. It makes you laugh, it makes you cry, and it makes you veryhappy. Sometimes the books of musicals are not brilliantly structured, but there is nothing superfluous about the plotting or the way things develop in Guys & Dolls. It's just so tightly and beautifully plotted. It's a bulletproof show. Not a bad thing with so many gangsters on-board! Guys and Dolls runs at the Savoy Theatre until 12th March 2016, before transferring to the Phoenix Theatre and reopening on 19th March. 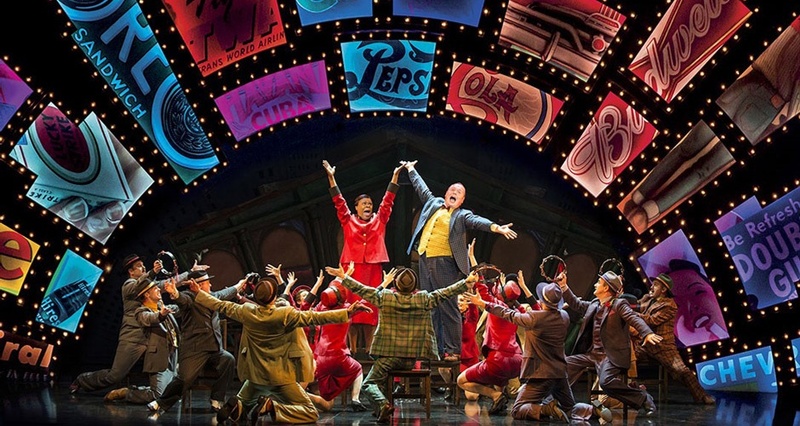 Guys and Dolls tours regional venues in the UK from March until July 2016.